When Texas Ranger Brett Tucker accidentally derails a wedding, he’s determined to bring the estranged couple back together...but he never dreamed he’d start falling for the bride! 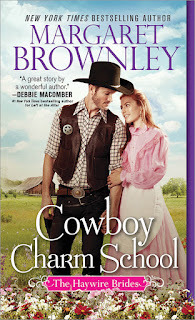 Enjoy this excerpt from Cowboy Charm School! “I know who you are,” she said, her voice as hard as the peanut brittle displayed in the glass counter standing between them. He sucked in his breath. If looks could kill, he’d be a goner for sure. Not that he could blame her. Thanks to him, not only was her interrupted wedding the talk of the town, the Haywire Dispatch had planted the story on the front page beneath a bold headline: Wedding Ends in Disaster. Brett cleared his throat. “I…eh…came to apologize again for what happened. I had no idea that there were two Frank Fosters.” Thinking that an explanation was in order, he continued, “The Foster I was looking for is a wanted man. I’ve been on his trail for a long while.” Twice Brett had almost caught him. Both times the man had slipped away. “I believe you’ve done quite enough already, Mr. Tucker,” she said, her voice as cool as the eyes boring into him. Tilting his Stetson forward, he rubbed the back of his neck. “I’m afraid that will be a little hard to do, ma’am.” A crime wave had hit the county, overwhelming local lawmen. The opportunity to serve as a special Texas Ranger couldn’t have come at a more opportune time. Brett was sent to Haywire to assist the sheriff in bringing the culprits to justice, but the reason he’d volunteered for the job was far more personal. “As you wish,” he said. He made quick strides toward the door before stopping. Glancing over his shoulder, he found her watching him. “Your dress,” he said. “I’d feel a whole lot better if you’d let me pay for any damage.” He had no idea the cost of a wedding gown, but it couldn’t be cheap.